Start off your visit on the 10th (Fri): take an in-depth tour of Anne Frank House. Get ready for a full day of sightseeing on the next day: admire the masterpieces at Rijksmuseum, then explore the world behind art at Van Gogh Museum, and then tour the pleasant surroundings at Vondelpark. To see maps, other places to visit, traveler tips, and more tourist information, read Amsterdam vacation planner . Mumbai, India to Amsterdam is an approximately 10-hour flight. You can also do a combination of flight and train. The time zone changes from India Standard Time (IST) to Central European Time (CET), which is usually a -4 hour difference. When traveling from Mumbai in August, plan for a bit cooler days and cooler nights in Amsterdam: temperatures range from 26°C by day to 15°C at night. Wrap up your sightseeing on the 13th (Mon) to allow time to travel to Prague. Prague is known for historic sites, nightlife, museums, fun & games, and zoos & aquariums. 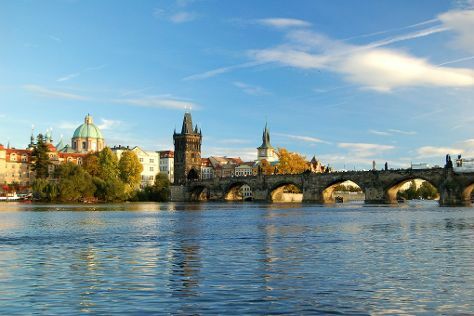 Your plan includes some of its best attractions: snap pictures at Charles Bridge, get engrossed in the history at Jewish Museum in Prague, get the lay of the land with Walking tours, and contemplate the long history of Old Town Square. For ratings, maps, more things to do, and more tourist information, refer to the Prague trip planner . Fly from Amsterdam to Prague in 4.5 hours. Alternatively, you can do a combination of train and flight; or drive. Expect a daytime high around 28°C in August, and nighttime lows around 16°C. Wrap up your sightseeing on the 16th (Thu) to allow time to travel to Vienna. Vienna is known for museums, parks, nightlife, historic sites, and zoos & aquariums. Your plan includes some of its best attractions: stroll through Schönbrunn Palace, explore the world behind art at Kunsthistorisches Museum Wien, contemplate in the serene atmosphere at St. Mary's on the Bank (Maria Am Gestade), and contemplate the long history of Belvedere Palace. Getting from Prague to Vienna by flight takes about 3 hours. Other options: drive; or take a bus. August in Vienna sees daily highs of 31°C and lows of 17°C at night. Finish your sightseeing early on the 18th (Sat) so you can travel back home.